Learning to figure out matching hatches fly fishing can seem like a daunting task for new fly fishers. The purpose of this article is to inform and share ideas with anglers that desire an understanding of the process involved. The past few weeks have been excellent with excessive hatches that many refer to as a complex hatch as defined by Swishers and Richards book Selective Trout. The complex hatch refers to a multitude of insects all hatching at the same time. This can seem confusing to new fly fishers but there is a quick fix in these scenarios. The other gem that Swishers and Richards referred to often was a compound hatch. A compound hatch refers to the fact that the obvious is not so obvious at times. This occurs when a large or brightly colored insect is on the water at the same time as smaller and darker insects that are difficult to see for the angler. The best way to distinguish is the use of a stomach pump to sample what the trout has eaten most recently. Another method is to use a screen seine on the surface of the water to identify the difficult tiny insect. The stomach pump for me personally was one of the most important tools I carried in the early years of my journals. The pump taught me how to react to what was working during specific hatches. Over time I became less and less dependent on robbing the trouts dinner because I had fished through enough seasons to know with confidence what patterns produced during what hatch. These times were often several different stages during the course of a day on the water. This included the nymphs to emergers, winged adults to egg layers and spinners. The main thing is some insects hatch helplessly at the mercy of the current speeds while others exhibit excellent mobility when hatching. Why is this important to you the fly fisher? Because fish respond to this in a different fashion of nymphs, emergers, and the dry fly! The usual rule of thumb is that trout feed by the law of conservation of energy which translates to the most vulnerable stages of the insect as prey. I have used many taxonomy books over the years for my region of the country. 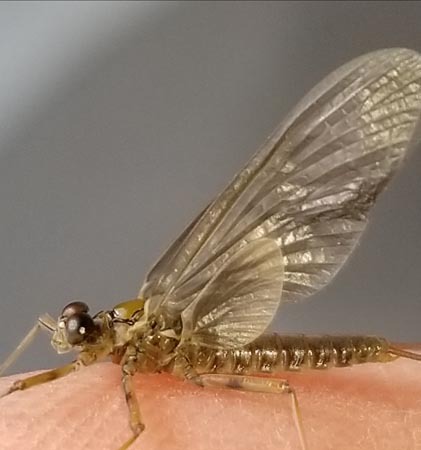 Another great resource is Fred Arbona’s book “Mayflies the Angler and the Trout” which is excellent for gathering info of what stages the insect is fed upon the most. Ernie Schwiebert’s book “Nymphs” was also a fine piece of work for hatches in North America. Out of all of them, the best resource in my region of the Smokies is “Aquatic Insect and Oligochaetes of North and South Carolina” by Brigham, Brigham, and Gnilka. They provided this tome for a study for Duke Power and they are among the leading authorities for the taxonomy of insects for of the Illinois Natural History Survey. Long before I had access to these fine resources I kept records in a database with actual stomach samples entered in with specific species and stages that trout fed on the most. 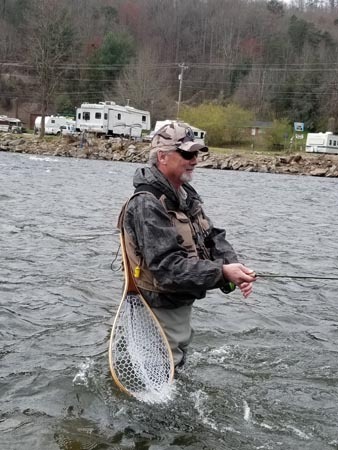 My database provided the hatch report with loads of empirical data to share with other visiting anglers to the Smokies and Western North Carolina. The rise forms assist us in the decision-making process but at these days and times is most certainly becoming a lost art form. The trout may focus on different insects selectively during a complex hatch. When many varieties of insects are on the waters at once I tend to use many patterns on the leader at the same time. A few droppers and a point fly make the process quicker to discern what fish are keying on at the moment. The rise forms include a slow sip, splashy rise, porpoise rise with head and tail, and small swirls just under the surface. These rise forms assist us with observation to make a guess as to emerger or winged adult on the surface. For example, caddis pupa is typically a very splashy rise form when the pupa nears the surface of the water. These subtle nuances are what brings us back to the water year after year to play the game of solving problems with hatches. The environment of new hatchery fish versus wild trout population also needs to be considered. The popularity of planted fish appeals to the masses. These fish, however, will take a good bit of time to adjust to the environment outside from their hatchery. Pressure from anglers also helps to educate the fish. 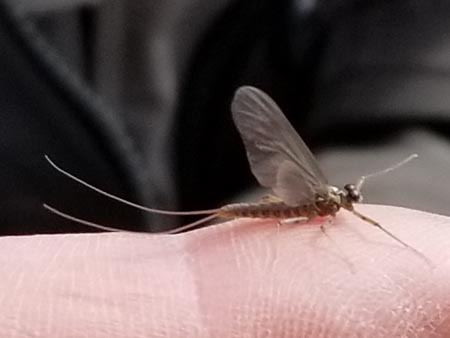 For example, the delayed harvest waters near me see loads of mops, squirmy, egg patterns, etc… and those that love to lob the “junk food” fly an oar length away on a float. I am old school in that when I see fish react to the real fish food available to them I want to play the game of solving the puzzle! 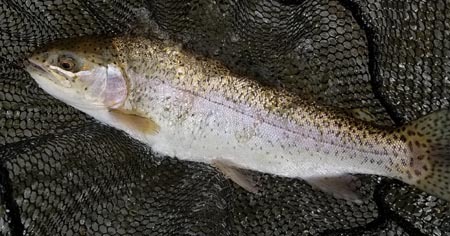 Mother nature conditions the trout much more than the pressure of anglers on a resource. It is also for this reason that the whole concept of lobbing a tight line rig all day (Euro-Nymphing) tends to lose its luster fairly quick because it can get mundane in a hurry! Not to say that dead drifting, lifting, jigging, swinging, and induced strikes are not all fun at times! So next time you see lots of fish working near the surface, do not get all wrapped up in the exact representation of an exacting bug! Play the game and go up top for some exciting fishing watching takes at a distance. When they are rising consistently it is one of the easiest times on the water to know with certainty the fish are looking up! I enjoy playing around with all types of dries during a heavy hatch full of variety. The fish get into a feeding frenzy and I feel fortunate to live in a region where they are rarely selective about patterns. Trout in the Smokies tend to remain opportunistic in feeding most of the year.